Pack size: 2 x 335ml bottles & 1 contact lens case. Traditional contact lens cleaning solutions can include substances that are known to irritate the eye, but this superb Regard Contact Lens Solution pack has a different approach. Review Regard Contact Lens Solution 3 Month Pack Value of money pack. Review Regard Contact Lens Solution 3 Month Pack I started using Regard a few years ago after my eyes became irritated by the other brands. Regard is brilliant, it does everything - it cleans and refreshes your lenses. I have never had an eye infection using it. Buying it VisionDirect has made the process much easier too as most pharmnacists/opticians I find do not stock it. I've given this product 5/5 for value for money as althoguh it is not the cheapest I can't put a price on infection free eyes and lenses. Review Regard Contact Lens Solution 3 Month Pack This solution is the only one that does not irritate my eyes. I've been using it for at least three years now, and very pleased with the results. Review Regard Contact Lens Solution 3 Month Pack I have used this product since I started wearing contacts and have been extremely pleased with it - no stinging and does the job. Review Regard Contact Lens Solution 3 Month Pack This product was recommended for me by my optician. Preservative free, it does make wearing my lenses comfier for longer. Regard Contact Lens Solution 3 Month Pack Excellent product. Great quality and value for money. Regard Contact Lens Solution 3 Month Pack Have used it for years and don't intend on changing that. Great solution No sting when inserting lenses, no deposits on eyelashes. Can use during the day to clean and wet. Replaces Boston Lens soaking solution, but still use their cleaning solution. Not looking at others. Regard Contact Lens Solution offers a completely preservative-free way to keep your soft contact lenses clean, without stinging your eyes. 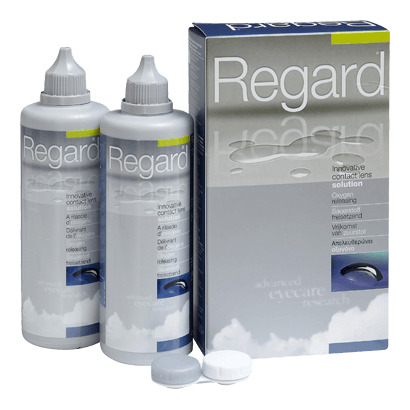 Manufactured by Advanced Eye Care Research, a UK based company dedicated to improving vision by offering reliable preservative free products; Regard offers the same level of disinfection as a peroxide combined with the convenience of a multipurpose solution. Regard uses an active disinfectant (OxyChloriteTM) that encourages the release of oxygen and breaks down your natural tears. This prevents your eyes from going dry or becoming irritable over time, and also allows proteins to naturally wash away from the lens. Regard improves the comfort of your lenses and keeps your eyes healthy for longer. Ideal to use for up to three months, Regard Contact Lens Solution contains a contact lens case and two solution bottles holding 335ml each. Regard Contact lens solution is suitable for all types of Soft Contact lens. For hard or rigid lenses we recommend trying RGP lens solution, also available from Vision Direct.